In French. In October 2018, the Éditions L'Harmattan in Paris released Bruno Deschênes' second book: Une philosophie the l'écoute musicale (A Philosophy of Musical Listening). In this second book, he brings together the European philosophy of aesthetic and the Japanese on, in the hope to discover how the Japanese sense of aesthetic could help us deepen our enjoyment of all music. It is available on the following web site: http://www.editions-harmattan.fr. Bruno Deschênes released a new solo CD on shakuhachi. It is available on iTunes.com, Amazon MP3 and CDBaby.com. The CD offers 10 pieces, 6 from different Japanese repertoires, while the 4 other are his own original pieces. One is solo, two are in duo and the last one is in trio. Released by ARC Music, U.K. 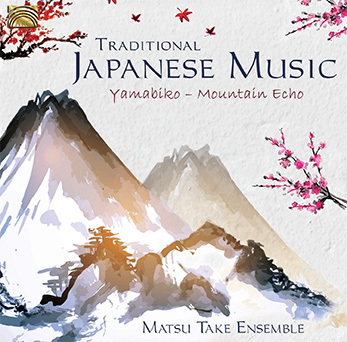 The 2016 CD of the Matsu Take Ensemble, Yamabiko, Mountain Echo, will be released internationally by the label ARC Music from U.K., on June 30, 2017. In French. 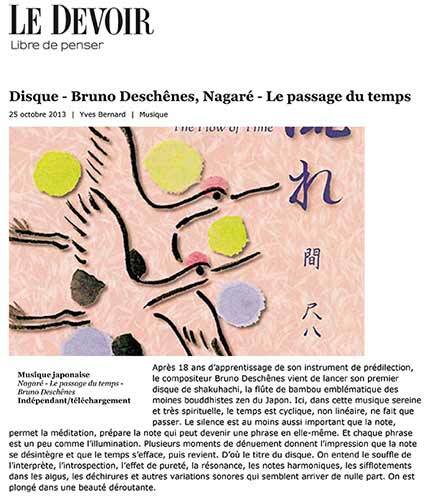 Bruno Deschênes has published a book in French on the shakuhachi. This book is the first in French entirely dedicated to the shakuhachi. Although ethnomusicological, it has been written from the point of the musician, looking in particular at how that musical instrument has been reinvented for our modern era. On Saturday 27, 2016, Michel Dubeau and Bruno Deschênes gave a concert alongside Alcvin Ryuzen Ramos in Sechelt, a small town north of Vancouver. For the occasion, Alcvin Ruyzen Ramos awarded to both of them their shihan, their master title in shakuhachi. Following up on their trip to Japan in November of 2015, Michel Dubeau and Bruno Deschênes attended on August 27 and 28 a shakuhachi making workshop with Alcvin Ruyzen Ramos, so they could make their own shakuhachi. Their understanding of honkyoku and shakuhachi was greatly deepened by learning how to make with one's hand such a beautiful flute. Le Devoir newspaper, Montréal, October 25, 2013. Bruno Deschênes has released in September 2013 a first solo CD on shakuhachi. He presents pieces from the honkyoku repertoire, the repertoire solo for shakuhachi. 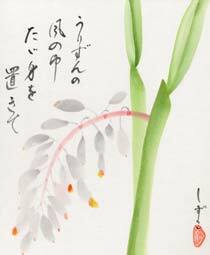 He presents also an original piece he wrote in the spirit of the meditative pieces, as well as an arrangement for 2 shakuhachi of one of the most beautiful piece for shakuhachi: Tsuru no sugomori, Nesting Cranes. This piece is traditionnally performed solo. Bruno Deschênes performs both parts. This CD is available on iTunes.com, amazon.com, CDBaby.com and Bandcamp.com. You can also hear it all on SoundCloud.com or Ethnocloud.com. In the last issue of Canadian Folk Music, vol., no. 4 (2013), you can read an article by Bruno Deschênes on the learning of the shakuhachi. The article is in French. Please, visit the following link to read it: http://www.canfolkmusic.ca/index.php/cfmb/issue/current/showToc. On March 2007, the Matsu Take Ensemble will launch its first CD. You will hear on this CD, titled The Mysterious Sound of the Wind in the Bamboo, Michel Dubeau and Bruno Deschênes on shakuhachi. They present shakuhachi solos and duets. They are accompagnied by Kayo Yasuhara on taiko (a Japanese drum) in 2 Japanese folk songs. Emiko Toguchi presents an improvisation on koto with Michel Dubeau playing the shinobue, a small Japanese bamboo transverse flute. You will hear folk songs, classical pieces, original pices by Michel Dubeau and Bruno Deschênes. Most of the duets are arrangement by Bruno Deschênes. You can buy the CD by visiting the following web site: www.123jam.com. Here is a first critics of our CD by Montreal's Le Devoir critic yves Bernard, published Friday, March 30, 2007. Unfortunately, it is only in French. In the "Instruments" menu, a new page on our technical needs for those who would like to book us. Design by Kwok Minh Tran. Artworks by Shizuko Matsunaga. Photos by Bruno Deschênes. For further information, please contact Bruno Deschênes at: bruno@musis.ca. or by mail at 50, Hudson Ave., apt. 102, Mont-Royal, Montréal (Québec) H3R 1S6. Telephone: (514) 277-4665.